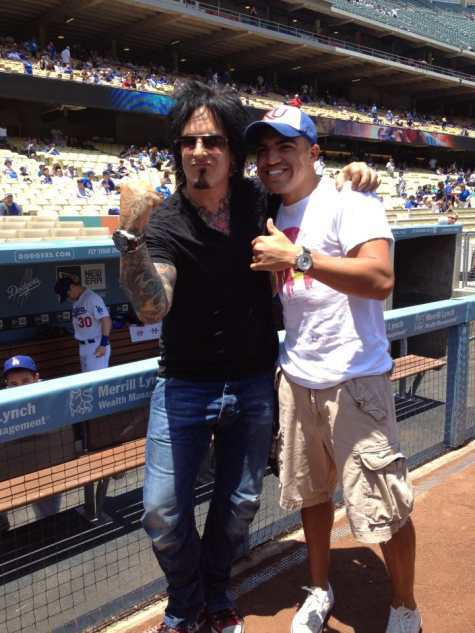 Motley Crue bassist Nikki Sixx threw out the first pitch in Dodger Stadium prior to Sunday’s Los Angeles Dodgers game vs. the Houston Astros. “My family had a blast and it was nice for me to connect with the great Victor Ortiz, who I think is a great fighter,” Nikki continued. “If you remember back, I was really disappointed in Floyd Mayweather for the sucker punch he threw at Victor and, after meeting him, I see what a class act he was for not slagging Floyd in the press after that cheap shot....Here we are hanging out (see photo below). MLB has the video of Nikki’s Dodger experience here.